Plantar fasciitis treatment is common among runners in Midtown Manhattan. Treatment for plantar fasciitis usually can be done at home, but requires you to take a break from your running schedule. If you don’t stop, plantar fasciitis treatments become more invasive, your pain can get worse and lead to treatment plantar fasciitis risks that may sideline you for good. Come to our sports injury and pain management clinic to get your pain evaluation and treatment. Meet our pain doctor Febin Melepura M.D. to get the pain relief you need in the safe, reassuring hands of the best sports pain management specialists in NYC. The band of thick, fibrous tissue that connects your toes to your heel bones — running across the entire bottom of your foot — is called the plantar fascia. Plantar fasciitis occurs when that ligament becomes inflamed and causes you to seek plantars fasciitis treatment in Midtown Manhattan. Plantar fasciitis is one of the most common causes of foot pain, heel pain in particular. Most noticeably, the condition causes strong, stabbing pains through your foot when you first step out of bed in the morning. The pain usually subsides after a few hours and then worsens again as the day goes on and you spend more time on your feet. In New York City, your sports medicine doctor and pain management specialist mostly sees plantar fasciitis in runners. And once you get an inflamed plantar fascia, the discomfort becomes especially bothersome because it can take months before it heals. On top of that, it’s very difficult to find running shoes that help to alleviate the pain. Being overweight. The excess pressure on your feet takes its toll on your ligaments. Aging. The condition commonly forms between the ages of 40 and 60, but can hit younger athletes too. Walking abnormally. An awkward gait or having flat feet or high arches can strain your plantar fascia. Working. Jobs that require you to be on your feet all day, especially on hard surfaces, like in a store or factory floor, put you at greater risk. Exercise. 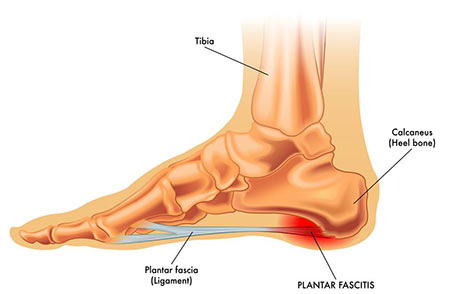 Certain movements that require ballistic jumping, such as in aerobic dancing and ballet, place significant stress on the plantar fascia, requiring treatment for plantar fasciitis. With plantar fasciitis, you don’t always feel the pain in your feet while you’re running or exercising. More often, it hurts when you stop. Just like when you first rise in the morning, you also may feel the pain worse when you get up after sitting for a while. You may feel the pain in your heel at the end of a long day on your feet or after wearing shoes with a hard sole. The pain is sharp and feels like something stabbing your heel. Seek plantar fasciitis treatment as soon as possible to prevent further complications and to learn how to adjust your workout or work life so you won’t be out of commission for more than a few weeks. Additionally, without appropriate plantars fasciitis treatment, you may unknowingly adjust the way you stand, walk and move that can lead to back pain, herniated discs or muscle spasms. That’s another reason to seek treatment early. Extracorporeal shock wave therapy. Sound waves sent to your painful heel stimulate healing. When other plantar fasciitis treatments don’t work for a chronic condition, this may help. On the other hand, it can cause more pain, numbness, tingling, bruising and swelling. Injections. You can get temporary relief when steroid medicine is injected into your heel, but too many injections can lead to a ligament rupture. Ask your Manhattan sports medicine doctor about platelet-rich plasma (PRP) injections that provide relief with less risk of damaging the fascia. Scar tissue removal. A procedure called Tenex involves removing painful scar tissue as a plantar fasciitis treatment without surgery. It’s rare that you need this procedure, but it may become necessary if your pain is debilitating. Surgery as a treatment for plantar fasciitis involves detaching the plantar fascia from your heel bone. The effect is to weaken your arch, but at least it won’t hurt anymore. Do you have any questions about the plantar fasciitis treatment we offer in NYC? 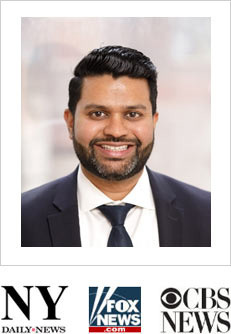 Would you like to schedule an appointment with the best rated foot pain management doctor Febin Melepura MD of sports pain management NYC clinic? Please contact our office for consultation with the pain relief specialist in Midtown Manhattan.